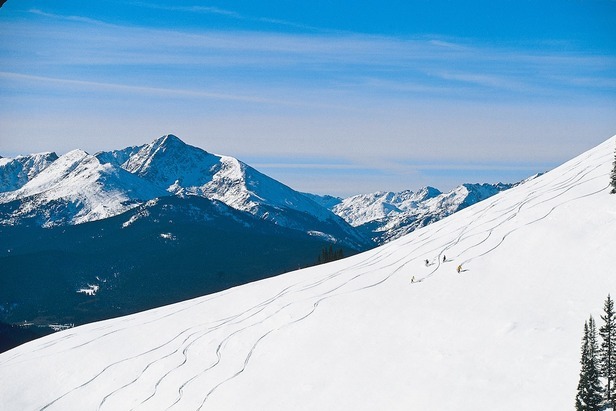 Time your trip right and enjoy Vail's legendary back bowls on a blue sky powder day. Locals swear this is one of the reasons they stick around season after season after season. Before tackling Vail’s 5,289 acres of skiable terrain, fuel up on made-to-order beignets (chocolate chip and raspberry are favorites) and locally brewed coffee at the Beignet Café, located at The Sebastian Base Camp. Once you’ve filled up on fried, fluffy dough, head to Gondola One, which Vail introduced in late 2012 to replace the outdated Vista Bahn lift. The 10-person gondola boasts WiFi, heated seats and moves skiers up the mountain nearly two minutes faster than its predecessor. The result? No more powder-day lift lines. From the top of the gondola, hop onto Lift 4 and head to the top of the mountain, where you’ll be within striking distance of some of Vail’s best runs. Follow the signs to Vail’s famous back bowls or lap Lift 11, hitting Northwoods’ gems like Gandy Dancer and North Rim. For a long, solid cruiser, schuss down Riva’s Ridge all the way to the village. Hop on the gondola and do it again. After racking up some serious vertical, you’ll be famished. Head to The 10th, a ski-in, ski-out eatery opened during the 2011/2012 season. Located at the bottom of mid-Vail’s Look Ma run, close to the base of Lifts 3 and 4, ski to it from the top of the mountain or ride Gondola One to its doors after one of those leg-burning Riva runs. Slippers, cubbies, stunning views of the Rockies and elk bolognese over tagliatelle await you. No doubt about it, Vail delivers killer après. Make like a local and head to Vendetta’s for a slice of pizza and daily drink deals. For live music and a sunny patio, try the Red Lion, which also serves up beer specials, amazing nachos and a lively après scene. Guitarist Phil Long plays rock ‘n roll classics from 4 to 6 p.m. If you want to carry day into night, hit the George for pool and an insider vibe, or Club 8150 for live music. When you’re ready to ditch those ski boots, kick back at the Sebastian Hotel, voted by Travel & Leisure readers in 2012 as one of the best hotels in the continental U.S. Enjoy a signature treatment, like the “8150 Elevation Attunement” from their spa, Bloom. For something with a little more down-home charm (and easier on your wallet), try the Alpine Creek Bed and Breakfast, a European-style B&B complete with a delightful innkeeper, delicious breakfast and freshly baked cookies waiting upon your return from the slopes.